Are your applications the old, dull, black and white variety of yesteryear? Do you find your users migrating to your competitors’ products because they offer audio/video content in their products and you don’t? 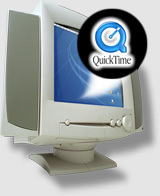 DesiSoft Systems can modify your existing applications to utilize Apple QuickTime technologies to satisfy your specific needs. In addition to adding QuickTime technologies to existing products, some of our past work has included porting and optimizing existing code and algorithms into Compression/Decompression (codec) modules, the means by which certain movies download faster than others.